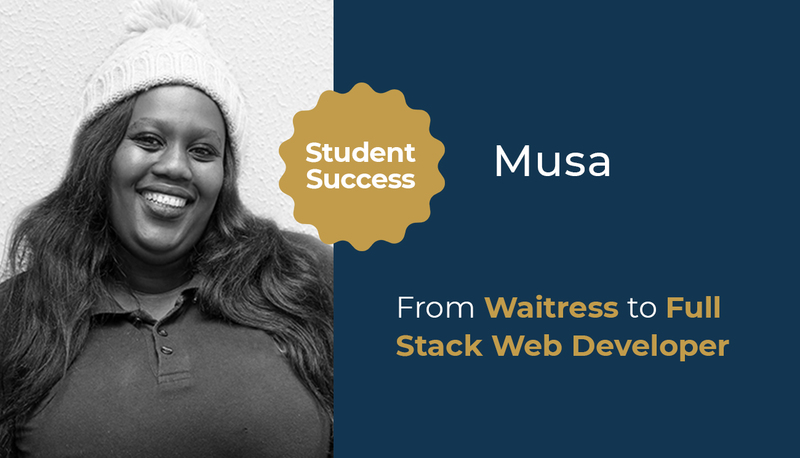 Musa was working through her university vocational studies as a waitress and cashier when she was introduced to HyperionDev through a learnership in systems development. After hearing about how in-demand a career in coding is, she was inspired to tackle a Software Development Micro-Degree and is now working as a Full-Stack Developer at EOH, an IT-service management company and one of the largest tech companies in Africa. Read on to find out more about Musa’s journey towards a career in coding. Tell us a bit about what you were doing before you started your bootcamp. I recently graduated from False Bay TVET College, where I did my National Certificate Vocational Level 2 to Level 4. During my university studies, I spent my time working a part-time job as a waitress. I applied for a learnership in Systems Development at Kingsway College and as part of our practical, we were sent to CapaCiTi. That is where I was introduced to HyperionDev and was inspired to do the Full-Stack Micro-Degree in Software Development. What Bootcamp/Course did you do and why? I did the Full Stack Micro-Degree in Software Development. I really wanted to complete this course because our lives revolve around technology and I wanted to be part of that technology. Why did you decide to switch to a career in coding? I decided to switch to a career in coding because I know how in-demand coding and programming skills are these days. A career in coding also pays well so it seemed like a very rewarding career path. Additionally, I know there aren’t a lot of African women in the industry so I am excited to be a part of this journey. Yes, the course has helped me in amazing ways. HyperionDev gave me the tools and resources that I needed to become a developer. It has helped me understand how the technology industry works and how I can be a part of it. Tell us about your experience of the 1:1 mentorship at HyperionDev. At first, I will admit that I found it very difficult to understand the coding, as at my university they taught us the basics and didn’t go as in-depth as HyperionDev’s curriculum did. HyperionDev gave us useful tools and resources that we could always refer to if we didn’t understand the tasks, which proved incredibly useful over the online course. As for the mentor, Sobane was always available to assist us with any questions that we encountered. The quick turnaround of his feedback helped me when I needed it the most and kept me from getting stuck in my learning. I enjoyed most projects that were related to learning a new programming language! I greatly enjoyed the projects that had me practicing and exercising my newly learnt skills in Python, Java, C#, HTML and CSS. People who want to change careers to become developers should know that they are in incredibly high demand! The industry pays well and it is very rewarding so you won’t go wrong with wanting to change careers to become a developer. You also have so many freedoms when becoming a developer; you have the freedom to work on what you want, when you want and where you want. A lot of companies offer flexibility in your schedule. Being a developer also lets you think out of the box and allows you to be creative and collaborative, as you work in a team of developers most of the time.